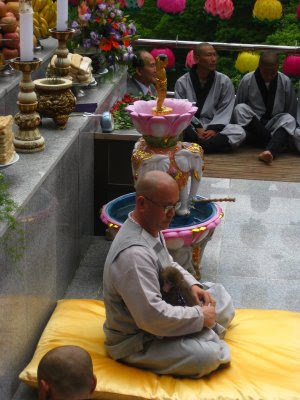 Back in 2002, when Japan and Korea were preparing to co-host the World Cup, monks from several temples around Korea met to discuss an idea to increase Korea's tourist hosting capacity while simultaneously improving awareness of Korean Buddhism. 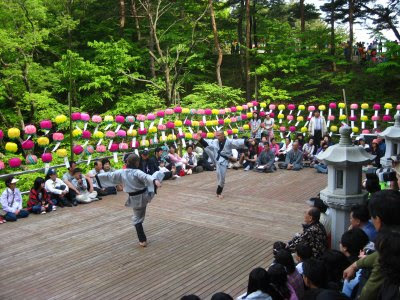 The templestay program that they developed has grown in success since then, and is now a major tourist attraction promoted by the Korean Tourism Organization. 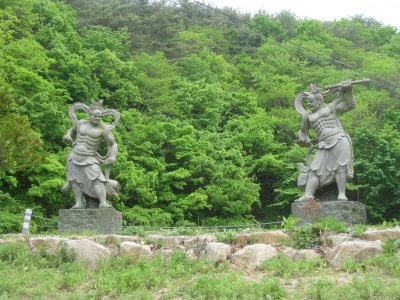 There are now dozens of temples throughout Korea that offer templestays ranging from one night to over a month. Since last Saturday, May 2nd was Buddha's birthday (부저님 오신날), Lisa and I decided there was no better time to do a templestay. It turns out that we were wrong - there definitely ARE better times to do a templestay, but I'll get to that later. 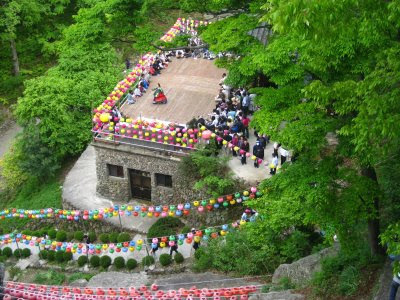 Few temples actually offer templestay programs during Buddha's birthday because they are usually crowded with tourists during this hectic time, but we found one, Golgul Temple (골굴사), that was taking reservations. One of my co-teachers, when she found out that we were interested in a templestay, rushed to print out information on all of the temples within an hour of us that had templestay programs. Golgulsa was one of them, and sounded like one of the coolest. The temple is into a hillside, the original 6th century temple building having been built out of solid rock and a series of caves, that slopes up a rocky embankment to an ancient carving of a Maya Tathagata Buddha. 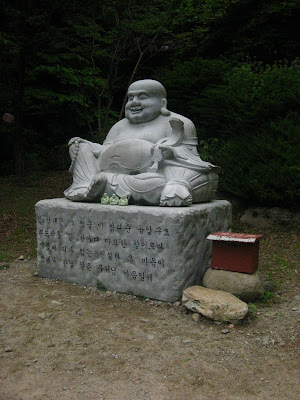 When Seol Jeog-un, Golgulsa's Master Monk, re-discovered the site in the late 70's, the temple was in a state of serious disrepair. 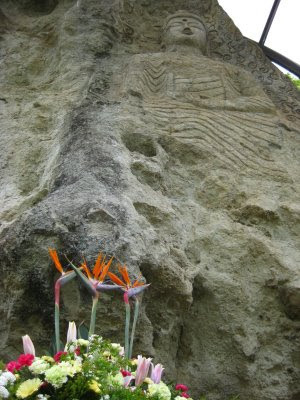 There were no roads that led to the temple site, and the Buddha carving was quickly being eroded. So he began the renovation process, installing a new temple building, several boarding quarters, and other buildings to support a full-time monk contingent. He also had built a protective covering over the Buddha carving to retard the erosion process. 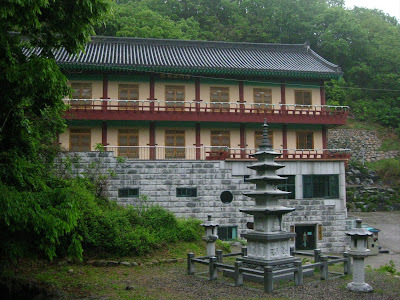 Golgulsa temple's Sunmudo is different from martial arts in that it is silent training, teaching Zen-meditation, Yoga, and the techniques of Buddhist moving meditation. The harmony of inner energy and physical strength is attained through a balanced combination of these slow meditative movements with selfdefense and fighting technique. Zen Buddhists believe that exercising both the mind and body in this way leads to good health, inner peace, and ultimately enlightenment. 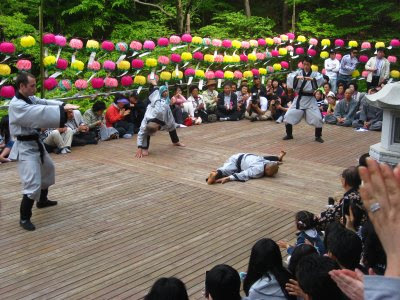 The opportunity to practice this philosophy and to experience life in a traditional Buddhist temple attracts martial artists and truth seekers from around the world to Golgulsa. We arrived just shy of 3pm on Saturday afternoon, when the Buddha's Birthday celebrations were to begin. We made the 15 minute climb from the temple gate up the hill to the temple grounds, which were bustling with people. 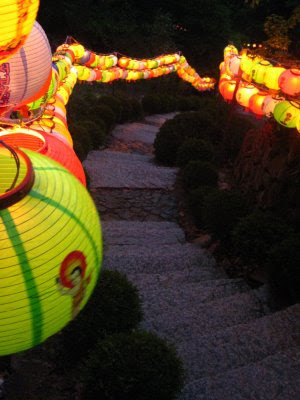 As Buddha's Birthday approaches, every temple in Korea decks itself out with rainbow strings of lanterns, and Golgulsa was no exception. 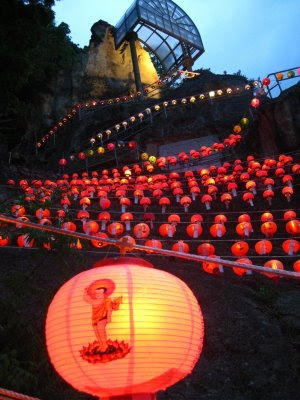 The walkway up to the temple was lined with lanterns, and the entire rock hillside to the right of the main temple was draped in a heavy coat of them. These guys were guarding the gate. I suppose 18-pack abs is normal for Sunmudo monks. 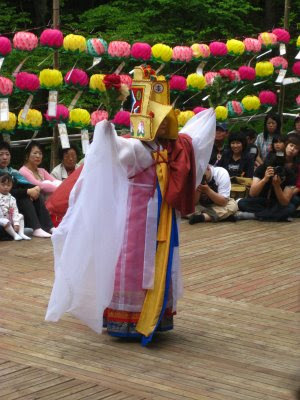 The monks demonstrated several Sunmudo movement progressions, and a couple of elegant, elaborately dressed women danced. The biggest benefit of staying the night on Buddha's Birthday was the lanterns. After nightfall the monks scattered around the temple grounds, connecting wires and flipping switches until all of the lanterns on the property were illuminated. As the darkness settled into the mountains, the thousand-or-so glowing globes seemed to float along the hillside, gently hugging the temple and ancient stone Buddha carving. It was beautiful. But we didn't have to do the templestay to see it - we could have just hung around after the show. Even without the Sunmudo training, though, when we laid down on our thin blankets on the hard wooden floor of our dorm, we quickly fell asleep. From 4:30 - 5:00am, we sat in a small, dim alcove under the main temple while the monks chanted to the rhythm of the gong. It was mesmerizing, and for the rest of the day the rise and fall of their deep voices would be ringing softly in my head. After chanting, we spent 30 minutes meditating, though the monks didn't give any instructions about what we should focus on during the meditation, a point I thought could use review in the future, particularly for first-time meditators. Perhaps, as monks, their meditative process is so ingrained in them that they don't think of mentioning it to others. Next we were supposed to do "walking meditation" but it was still raining outside so we were led through 108 bows instead. A monk stood behind us with the same wooden gong that served as our morning alarm, and he hit it once for every required bow. From a standing position, we would kneel, then prostrate ourselves forward, then back to kneeling, then stand up just in time for the next gong to sound. 108 times. It sounds excruciating, and it was at first, but after a while it was easy to get into a rhythm. We had been instructed by another, long-term templestay participant, to focus during each bow on something that we are thankful for in our lives, or something we would like to change. For the first dozen or three bows, all I could think about was how clumsy I felt, and how much my knees were going to hurt. But eventually my body took over the mechanics and left my mind free for meditation, and I closed my eyes. After a hot breakfast of soup and vegetables, we had our first Sunmudo training. (It would have been our second, had we not visited during Buddha's Birthday.) 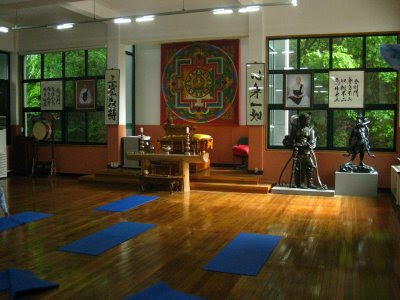 Golgusa has a really nice Sunmudo training center which looked pretty new, with beautiful dark wood floors and giant windows that looked out into the surrounding woods. It was a very peaceful place. 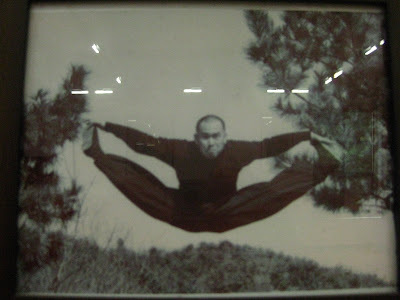 On the wall hung pictures of Seol Jeog-un in his younger days, demonstrating his athleticism and prowess. It was quite impressive. The first 60 minutes of the training were spent in postures very similar to those of hatha yoga, though they seemed fairly intense for a first day introduction to the practice. Borim, the monk that led us through the 90-minute session, was an 11-year Sunmudo veteran, having practiced in Seoul for 10 years before his full-time move to Golgulsa, and he didn't waste any time throwing his body into different twisted positions. Several templestayers gave up trying completely and just sat on their mats, watching him. During the last half hour we moved into the martial arts. Borim quickly wore us out, leading us through quick successions of punching, kicking and jumping movements. During the final few exercises he slowed us down and we worked on channeling our energy through concerted and precise motions. I quickly went from a feeling of exhaustion to one of power and control, one that I have rarely felt in my life. It was an amazing transformation, and I finished the session feeling energized and refreshed. Even when we discovered we had another 108 bows left, I was unfazed, and my mind quickly slipped back into the meditative state it left at the end of the last 108. After lunch, we showered and left. The soreness hit both of us like a train the next morning, and lingered for several days. As slighted as we felt having missed the evening Sunmudo session on Saturday, it was probably for the best. Even 90 minutes of training was exhausting. For future templestays, we'll plan to go during the week, when there are fewer other tourists, and for a longer period. Judging from our experience after even one night in the temple, an extended stay would be a welcome retreat, relaxing and invigorating at the same time, much like the 10-day buddhist retreat I attended in Kenya. But definitely more physically demanding. Sounds like an impressive visit, and well worth the stay. I'm guessing you didn't play with buddha's belly during his birthday?) I was WOW'ed by the one guy in the demo picture with his impressive split! You see the discoloration on Buddha's belly? I think it's safe to assume that EVERYONE plays with it. I was no exception. That guy doing the splits was probably the top student, he did a lot of really impressive stuff during the demo.